Google’s(s goog) Sundar Pichai had a lot to share on stage the Google I/O 2014 keynote on Wednesday. Between Pichai and another half-dozen Googlers, the keynote ran for about 2.5 hours, bombarding attendees with information on new features for Android, Chrome and other initiatives. So it makes sense that some things only got a few minutes of attention, and one of items that was actually the most interesting came when Pichai said Android apps are coming Google’s Chrome OS. On the surface that sounds great. There’s a bit of a catch though. If you thought the entire Android catalog of apps — some hundreds of thousands of titles — would magically and instantly work on a Chromebook, you thought wrong. These aren’t currently existing Android apps running in some type of virtual machine on a Chromebook. Instead, Pichai used the word “port” a few times, meaning Android software developers can bring their Android apps to Chrome if they don’t mind a little effort. It’s still good news for Chrome OS, which has largely been dismissed as “just a browser” by some for years. By comparison, Chromebooks can run relatively few apps when compared to other platforms. Adding Android apps will definitely help the situation, letting Chrome OS users run traditional looking apps as well as web apps. 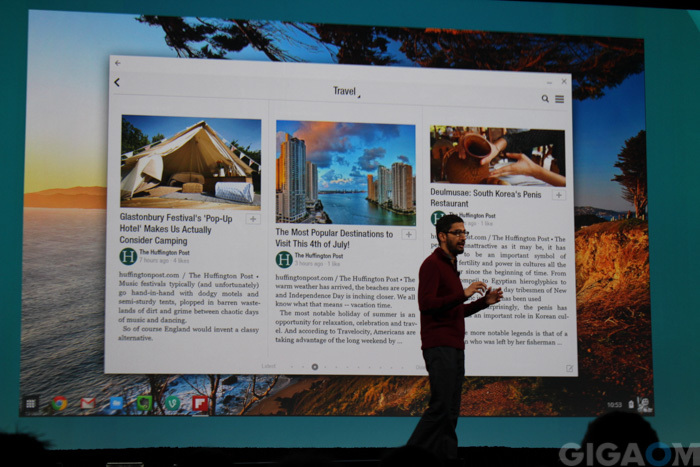 Pichai showed off a few examples such as Evernote and Vine. The latter is particularly interesting because the app can access the camera of a Chromebook in order to capture a video in-app. Google and others have been working on giving HTML 5 apps access to device hardware such as cameras and sensors. These examples aren’t terribly complicated apps; at least not by comparison to a graphics heavy game title for mobiles. I found these an interesting choice to show off, as a result. The news is also an extension of what Google announced at last year’s I/O event; only in the opposite direction. 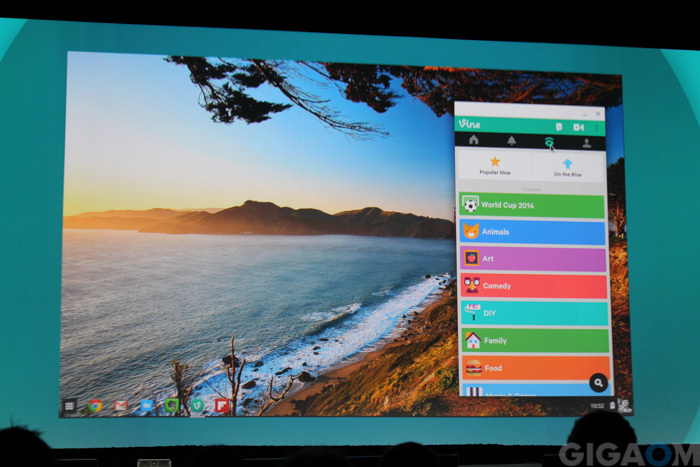 In 2013, Google showed off Chrome apps running on Android using Packaged App and Native Client technologies. These tools let developers port or package their web-based apps to behave like native Android apps. This year, it’s a reverse situation using new tools: Getting Android apps ported over to Chrome. Google is trying to make it easier for developers to do this, but it will take time for that to happen. Don’t expect tens of thousands of Android apps on your Chromebook any time soon as a result. Sure would be nice to have a few productivity apps on the Chromebook that ran natively. At least more natively than they do now. All Android apps follow the same principle as Chromebooks as far as I’m aware, which is online through some sort of cloud printing. To print natively from a Chromebook would require drivers, drivers require downloads, and installations, and of course, more space used locally. One option would be to get a cloud print ready printer, however, if you’re like me, you’ve already got a printer that works fine so going out and picking up another printer just isn’t going to happen anytime soon. Most of the time someone has at least one windows (or other OS) computer laying around when they pick up a Chromebook so having a computer attached to a printer when needed isn’t that big of a deal…especially if that other computer is a desktop. Also, in this day and age of mostly online content, external hard drives, usb drives, cell phone apps for auto insurance cards and other things, printing doesn’t happen as much as it used to. For me, I don’t print at home but maybe two or three time a year. Any other time I have to print is for work and I can use my work computer and work printers. Situations are different for everyone, and while I personally think the Chromebook meets 99% of my personal needs, I will also say that it’s not for everyone. You can use a print server appliance like this one – particularly useful for enabling printing on a high end legacy network printer in a school or office environment. You can also use a Raspberry Pi device as a cloud print server to allow cloud printing from local legacy printers.